BOB SCHIEFFER: Good morning again and welcome to FACE THE NATION. We’re going straight to Miami and Marco Rubio, the Republican nominee for Senate in Florida. Mister Rubio, thanks for coming. Most people who follow politics know you took on Florida’s popular incumbent Republican Governor Charlie Crist in the primary for the Republican Senate nomination. Before it was over he had left the party as you went up in the polls. He’s now running as an independent. Let me just ask you first, do you think of yourself as a Tea Party candidate? MARCO RUBIO (R-Florida/Candidate for U.S. Senate): Well, first, good morning and thank you for having me on your program. I don’t think anybody can make that claim about themselves because to do that you’d have to-- you’d have a fundamental misunderstanding of what the Tea Party movement is. I think the biggest mistake being made by those who follow politics is they're trying to understand what’s happening across our country through a traditional political lens, you know how you would view the Republican Party or the Democrat Party. The Tea Party movement is an expression of what I think is a mainstream widespread sentiment in America that Washington is broken, that both parties are to blame, and that people want to elect folks that are going to go to Washington, DC, number one and do what they say they’re going to do primarily stand up for the agenda that’s coming from there and offer some clear alternatives that embrace the things that make America exceptional. So for example, Americans believe in the free enterprise system. They understand that it makes us the most prosperous people in human history. And they don’t want to want-- they don’t want to walk away from it. 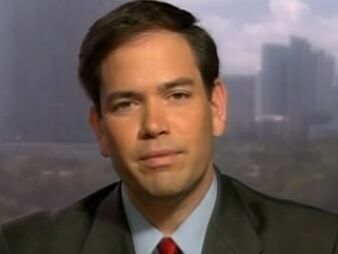 MARCO RUBIO: And so, I think the widespread sentiment is that we don’t want to change America. We want to fix the things that are wrong in America. And the Tea Party movement is an expression of that sentiment.